One of, if not the best virtual keyboard apps on Android, SwiftKey, just got better. The company has just updated the super popular app for Android to version 4, bringing with it a slew of new features. The most prominent, naturally, is the introduction of SwiftKey Flow, which lets users type via swiping from letter to letter, just like the Swype and Google’s Gesture Typing keyboard. However, unlike Swype and similar to Gesture Typing, SwiftKey integrates the gesture typing together with the standard typing mode, and brings the company’s legendary word prediction algorithms to the fore, making SwiftKey 4 one of the best virtual keyboard apps out there. In addition, SwiftKey has also added support for six new languages, bringing the total to 60. Also, the improved prediction engine also means SwiftKey 4 now adapts to your typing style over time, which brings and end to the “rapid” or “precise” modes in favour of an intelligent new adaptive system. Finally, to celebrate the launch of SwiftKey 4, the app is now going for half off for both smartphone and tablet versions. Also, the company will be giving away a Nexus 7 tablet to one lucky winner in SwiftKey’s Twitter contest. 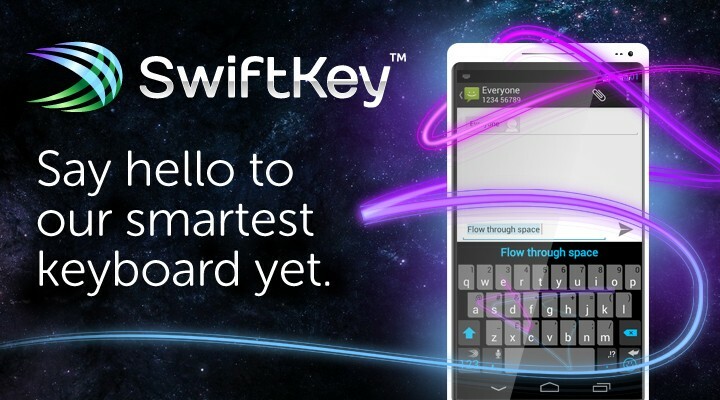 Head on to SwiftKey’s product page here.